I picked up a book at Goodwill yesterday from 1945 on etiquette. It is actually laugh out loud funny and also sad at how much we've slipped as a culture into just 'whatever'... though I have to admit, I'm also thankful because I'm not a fan of pretension or fussiness. From Mrs. W. B. Riley: Hospitality is confessedly in decline. The guest chamber (what? Guest chamber? Like a guest reception area? jail?) is no longer found in every house; but the one social center that survives is the dining table. 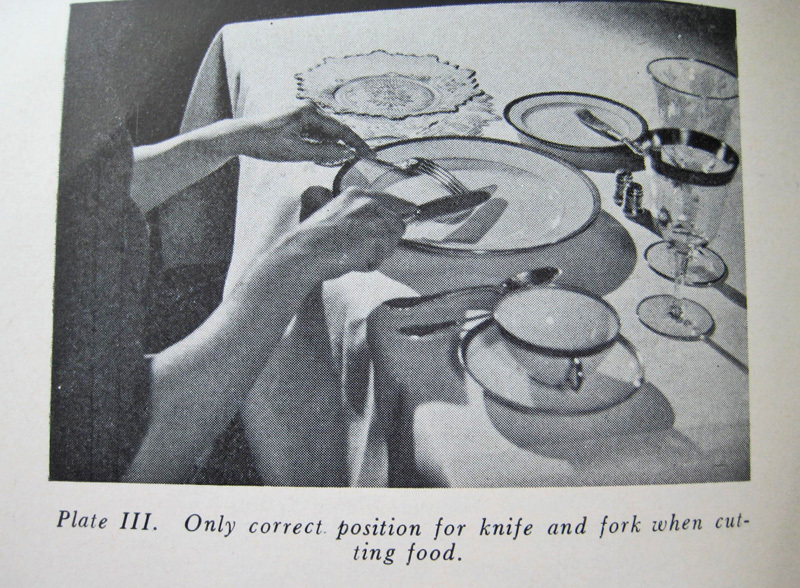 When no knife is being used, the fork is held in the right hand, with prongs up. However, it is entirely correct (and European) to convey meat to the mouth with the fork held in the left hand; then the knife may be retained in the right hand. Do not overload the fork. Burdens dripping with juice and gravy must not be lifted to the lips. 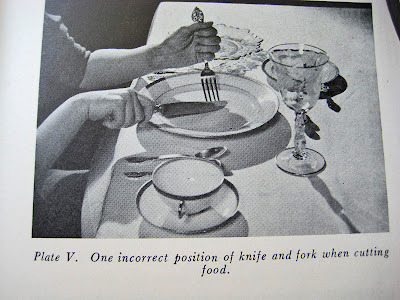 One of the most vital rules is that which exacts noiseless eating. All food should be taken in moderate mouthfuls and chewed with little hurry and no apparent effort. Toast and crisp foods should be taken in small quantities. When the mouth is filled with food, it should never be opened until the last morsel is consumed. Half-opened-mouth eating is disgusting. A careful person will take up food from the plate without unnecessarily striking either knife or fork against the china. What did we learn from Mrs. W.B. Riley today? 1. My boys are disgusting. 2. 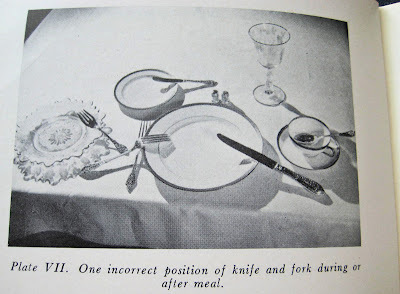 No spearing at the table, eat like Tommy. 3. 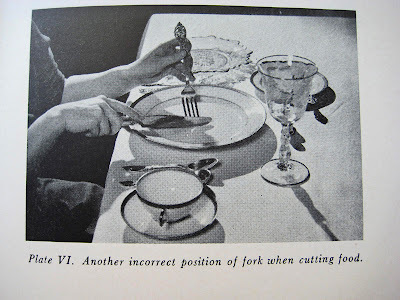 Fork prongs down when cutting, up when no knife-ing, and never use to illustrate converstaions. 4. And I must remember, I do not serve my meals on "plates", but rather "china". 5. Sincerely, Mrs. C.D. Denker. 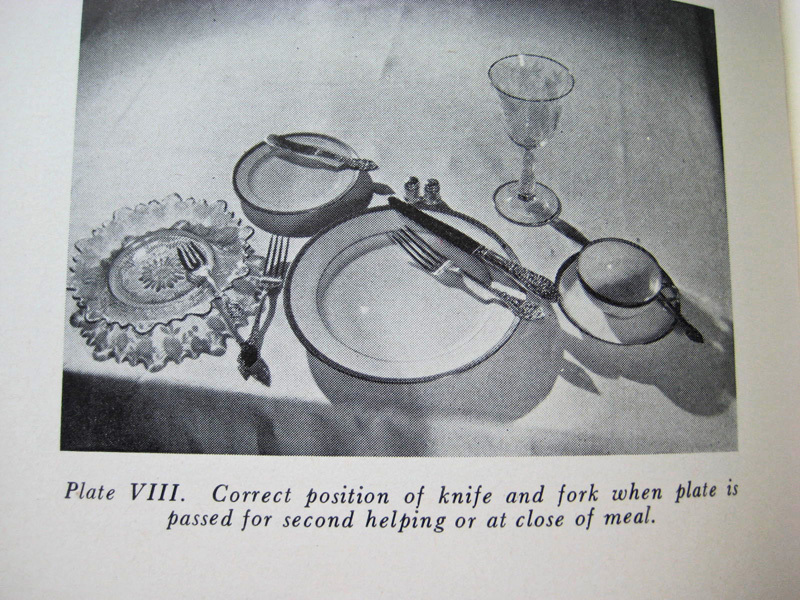 That first image is one that urks no end me when I see it...I first saw a fork strangled in such a manner on my first flight to the USA...Such miss use of a utensil would have got me cracked across the knuckles with the back of my fathers butter knife as a child...not good etiquette or proper of a utensil use either I am sure...but none the less what would happen. It does sadden me how by the way side many social graces have fallen. Excuse my typos...it is hard to type and make corrections with a 3yr old snatching at your hand and screaming that daddy will not play with her. hmmm Can I borrow that book to teach her some manners? ?